SINGAPORE, Apr 16, 2018 - (Media OutReach) - LikeCoin (http://like.co/), a blockchain protocol for independent content creators, which provides a mechanism for creators worldwide to be rewarded for their original or derivative works, spread the word about their mission to empower creative collaborations at the Creative Commons Global Summit 2018, an event where an international community of leading technologists, legal experts, academics, activists, and community members gathered together who work to promote the power of open worldwide. In today's digital-first age, individuals who work in the creative profession would have been approached at one point or another to work on creative content for free, or to have their content published on social media and merely "rewarded" by Likes. LikeCoin's vision is to maximise creativity by coupling practical recognition and Creative Commons. 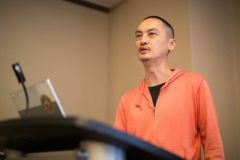 "Creators will be recognised with LikeCoin when their work is 'liked', 'super-liked' or re-created by the community," said Kin Ko, co-founder of LikeCoin, who descended on Toronto, sharing his vision of the future with some of the brightest minds in the world's creative scene at Creative Commons Summit 2018. "These creators also stand to gain exposure through LikeCoin events across markets in Asia, alongside established artists such as Kit Man, yanSquare and mankenlive." LikeCoin creates unique fingerprints for all creative contents and traces footprints of all derivative works along with creators and distributors of the content. Powered by a global, decentralised and resilient IPFS-based technology, LikeCoin's reinvented Like Button and LikeRank algorithm will enable attribution and collaboration of content across multiple platforms and applications, allowing content creators and adopters to curate contents and record the data on blockchain for other distributors to use. "I believe in LikeCoin for what it's about to bring to creators and creative organisations is nothing less than the Renaissance to people in and out of the circle." said one of LikeCoin's early supporters To Cheung, Founder and CEO of UDOMAIN. The LikeCoin ecosystem will support creative content in many formats including photos, illustrations, videos and articles. Original content may be distributed by content distributors directly or modified, forming derivative work which can be adopted for use by content adopters. At the same time, LikeCoin's unique Proof of Creativity mechanism and blockchain Smart Contract are proven to incentivise creators and will help drive broad adoption by distribution platforms and service providers in the ecosystem. "LikeCoin is a unique project that truly allows artists to come together to distribute, remix, tweak, and derive many more original creative content that a society needs, especially in order to create wider awareness and conversations of a particular issue or topic," said Kit Man, an established multimedia designer from Hong Kong. To date, LikeCoin has successfully raised over USD3 million dollars in private sale. In the 12 months since the project's inception, over 1,000 creators have already signed up with LikeCoin's creative network in markets across Hong Kong, Taiwan, Japan and others. LikeCoin aims to reinvent the "Like" by realigning creativity and reward. LikeCoin enables attribution and cross-application collaboration on creative contents. With a reinvented Like button and its unique LikeRank algorithm, LikeCoin traces content footprint and reward creators by Proof of Creativity mechanism. Kin Ko, co-founder of LikeCoin, shared his vision of the future with some of the brightest minds in the world's creative scene at Creative Commons Summit 2018.